Looking like a pair of eyeglasses only a rock star would wear, this nebula brings into focus a murky region of star formation. 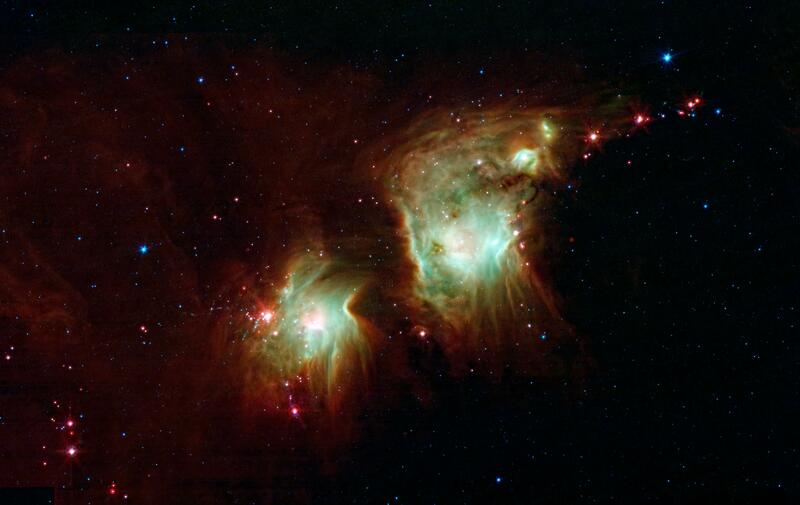 NASA's Spitzer Space Telescope exposes the depths of this dusty nebula with its infrared vision, showing stellar infants that are lost behind dark clouds when viewed in visible light. The light from young, newborn stars are starting to carve out cavities within the dust, and eventually, this will become a larger nebula like the "green ring" imaged by Spitzer (see PIA14104). This is a three-color composite that shows infrared observations from two Spitzer instruments. Blue represents 3.6- and 4.5-micron light, and green shows light of 5.8 and 8 microns, both captured by Spitzer's infrared array camera. Red is 24-micron light detected by Spitzer's multiband imaging photometer.